Our community has 3,117 members, 147 online now. We’ve published 9,772 stories, shared 8,323 images, made 10,347 blog posts and written 121,511 forum posts. It was cold, so cold, as the sun began to rise in the east, casting the first rays of warmth across the rolling hills. The mist was lying in the valleys and as I rode slowly along the twisting, rutted road weird shapes seemed to appear suddenly then disappear just as quickly, as the thin mist twisted the beams of light into contorted shadows. In the far distance I could see the dark green canopy of the forest rising above the low lying mist. That was my destination, for now at least, because I did not dare to sleep without some protection, even if it was just to be able to rise above ground level for a few hours. It was the morning of the sixth day since leaving the city of Pelengrath, my home. It had been under siege for almost a hundred days and the stocks of fresh food had long since run out. The people were living off oats and wheat and it was only a matter of time before that too would be gone. My father, King Wendell had been wounded and was lying in a fever as infection had set in. We desperately needed help and as my brothers were needed to lead the defence, it fell to me to seek the help we needed to relieve the city before it fell. So, in the dead of night, I took my horse, Fleet-foot, wrapped sacking around his hooves to deaden the sound of his shoes on the stones, and led him silently through the secret gate and into the forest surrounding the city. It had been frightening as I led him through the trees, past the fires of the enemy and almost falling over the prone body of a sleeping guard but we got through and once we were clear I removed the rags from his feet, climbed astride his powerful flanks and rode as fast as his legs would carry me, putting as much distance between us and the city before the sun rose in the morning. That was five days ago. It had been two days since I had slept as Fleet-foot carried me safely on his back. I slumped forward in the saddle, the sudden movement making me snap back to wakefulness. I couldn't sleep until I reached the comparative safety offered by the dense woods still some miles ahead. I was glad of the fog, which the thickening mist had become, as I could ride almost invisibly, covered by my long, heavy grey hooded cloak which also hid the long sword hanging from my waist in its leather scabbard. On my back I carried a quiver of arrows for the bow which lay across the saddle in front of me. I had learnt the art of swordplay from my brothers and archery was a sport we all competed in against each other. At twenty-three I should have been married but in these troubled times I had refused to follow the conventions placed upon me and had remained in the city, growing up alongside my older brothers and learning the arts of warfare alongside the duties of being a wife and mother, which were the duties more expected of a princess. I had to stay alert, the lands about me were frequented by bands of marauding villains, men who would kill at the blink of an eye and there were wolves, hungry after a lean winter, roaming in packs which would devour a horse in the time it took to take a breath. Suddenly, a sound! I reined in and listened. I could hear voices ahead of me. Looking around for shelter I could see nothing, nowhere to hide, so I spurred on Fleet-foot and guided him off the road and onto the grassland, hoping to be hidden by the fog. I didn't dare go too far for fear of losing my way, so as soon as the road was out of sight I stopped and waited silently as the sound of the horses' hooves approached. My heart was beating like a blacksmith's hammer, the blood pounding through my ears as they strained to hear. I dismounted and stood alongside Fleet-foot, holding his reins with my left hand whilst my right gripped the handle of my sword. "She would be stupid to come this way," a gruff voice spoke through the swirling shadows. "Maybe that's what she wants us to think," a second, higher pitched voice, replied. "You seem to forget, she was seen a couple of days ago by the Watchers." "Pah! The Watchers. Just because they saw her doesn't mean she is heading for the forest of Mallagen!" Gruff argued. "Really! and where else will she go to get help? We have overrun every nation this side of the mountains. That gruesome forest is the only place left that harbours those who dare to oppose Samerron. She has no choice, so shut your yap and keep your eyes and ears open." "I hope we find her first," Gruff again, "I've heard she's a bit tasty, It's a long time since I've had a good looking woman!" I shuddered in horror at the thought when Squeaky went on; "You won't lay a finger on her, moron! You know the orders. She knows the way into the city. Samerron will get it out of her. She is to be delivered to him untouched! Got it?" "Yeah, I get it," came the dejected reply. "Can't stop me having a feel though." "Untouched, I said! Anyway, what do you mean a long time? You've never had a good looking woman." The sounds of guffawing trailed away into the distance as the riders went on with their search. My heart sank. They knew about me. Now I had to be extra vigilant if I was to make it to the forest and find the help I had set out for. Placing my foot in the stirrup, I remounted Fleet-foot and leaned forward, laying along his shoulders and patting his neck, then, sitting erect once again I gently pressed his flanks with my heels and clicked my tongue and we moved off, back to the road, walking steadily and listening carefully. My long brown hair was wet with dew, even though I had pulled the hood down over my forehead, leaving just enough room to see the road ahead through the swirling mists. As the day wore on, the fog didn't clear but seemed to get even thicker. The sun was high in the sky, but the thin clouds prevented any real warmth from reaching the earth. I was straining my eyes and ears to hear even the slightest sound but the fog deadened everything. I was so weary now I could hardly sit upright and my head kept tipping forwards as sleep tried to overtake me. I moved the long dank hair from my face and dug my knuckles into my eyes in an effort to stay awake. It couldn't be much further now, surely, but with the fog so thick I couldn't tell. High up in the sky, out of view, an eagle screeched. The sound sent a shiver right through me as it echoed around the hills and valleys. Samerron was powerful and ruled all the lands about. Some said he was a wizard, with a far-seeing eye, but the truth was, he was just a man. A man who could bend the will of others with his powerful words and ruthless punishments, but he could not control the birds and the beasts. No, the eagle was searching for prey, he would not harm me. I began to notice that the ground was rising and suddenly I was out of the fog. The road was climbing around the side of a hill and I could see where I was at last. My heart sank. I had been riding parallel with the edge of the woods for some miles. If it hadn't been for the damnable fog I could have rested some hours ago! I pulled on Fleet-foot's reins and we walked slowly back down into the fog and towards the line of trees I had seen a little distance away. Eventually, a large tree loomed out of the fog ahead of me and then another and another. I began to relax a little, knowing that soon I would be able to sleep. “Stand still, Lady!” a rough voice shouted and a man on horseback suddenly appeared out of the thinning fog in front of me. He was dressed in some kind of mail and was holding a sword in his right hand. Instinctively I drew my own. “She's got some spirit, I'll say that for her.” Another voice, this time from behind. I turned and saw another, similarly dressed man holding a crossbow across his lap. It was loaded and drawn. “Come near me and I'll kill you both!” I screamed at them, hoping they might be scared away... but no. With a click of his tongue he began to move nearer to me. 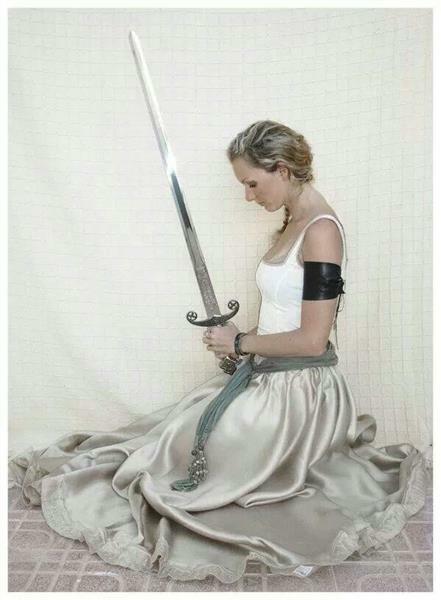 I gripped my sword more tightly. He moved nearer still and I raised my sword. From the corner of my eye I saw the other raise his crossbow and point it at me. I was trembling with fear, but I was not going to get this far just to give up without a fight and I could not let them take me alive. In a flash I reached into my cloak and drew out the razor sharp dagger I kept hidden and held it to my own throat and, at the same instant I saw the crossbow levelled. There was a hiss, a faint thud and the crossbow fell to the ground, unfired, followed by it's owner who now had an arrow protruding from his forehead. His horse reared up and fled into the fog. The first soldier turned and twisted, this way and that, to try to see where the arrow had come from, then spurred his horse in the direction taken by the riderless animal. He had barely moved two strides when his horse too, reared up and he fell to the ground with an arrow through his neck, blood spurting from the entry point where it had severed the main artery, felling him in an instant. I looked around, trembling with fear, but could see and hear no-one until, suddenly, another man dropped from a tree and landed, upright, beside me. On his back he wore a quiver of arrows and a bow, at his side was a sheathed sword. His clothes were a mixture of brown and green fabrics and his face was covered in dirty streaks. I didn't move. Was this all a trick? When I let my guard down, would they take me anyway? I still wasn't sure, but I had no choice, I had no strength left in me and I relaxed the dagger from my throat and let the sword droop until it fell from my grasp and landed with a heavy thud on the ground beside my horse. The relief was so great that my exhaustion finally overcame me and I slid sideways from my saddle and I knew no more. When I opened my eyes I was laying on a mattress of soft straw in what appeared to be a large hall made of logs with a fire burning in the centre, the smoke curling lazily up to an opening in the roof. I was fully dressed, but my sword belt and dagger, along with my bow and quiver, were lying beside me and my cloak had been drawn over me like a blanket, keeping me warm as I slept. Around the great hall, men were sleeping or talking in hushed voices, I lifted myself onto one elbow and surveyed the scene. “Ah, you are awake,” a female voice spoke softly. I looked up and before me I saw a beautiful woman in a white hooded cloak. It was laced up the front and the sleeves split at the elbows where armlets of woven silver adorned the fabric as it fell away leaving her forearms exposed. The white linen hood hung loosely around her head and her beautiful face was framed by her long dark hair falling in waves until it reached her firm full breasts. “Well met, Anna.” I clasped the hand she held out to me and as I held it tightly a strange sensation passed through me, a feeling I had never had before and as we put our arms around each other in an embrace of kinship I felt as though we were one and that together we were destined to conquer the enemy and bring peace back to the lands and freedom for our people. As we separated I looked into her beautiful brown eyes and stared deep into her soul and I saw that she had felt this thing too, this strange feeling that was to bind us and give us the power to defeat this evil that abounded the land! “Yes?” A pause as we both looked at each other then laughed. The messenger looked confused. Astrid became stern and stood proud, her beauty and majesty shining forth. I draped my cloak over my arm and picked up my sword and dagger, bow and quiver, then she took my hand and led me from the great hall and out into the forest. The sun was high in the sky and the rays were warm and welcoming. As we walked I watched her dress flowing behind her and the white fabric as it embraced her legs with each and every step. Her long dark hair flowed over her shoulders as the air caused it to flow out behind her while she walked. The long sword at her side, its golden hilt like a cross was adorned with dragons' heads with deep red garnets for their eyes at either end of the guard cross and a large blue tanzanite set into the pommel, glinted and sparkled in the sun. She took me to a small house not too far from the great hall and stepping inside I saw it was a bathhouse. A fire was burning to one side with a huge cauldron of water hanging above it. Astrid bade the two women there to fill a tub and then to leave us. Once they had left, the Warrior Princess turned to me and said, "I will wait outside by the door. Call out when you have finished and I will come and get you." I didn't know why, but I looked at her and said, "No, please stay. I don't want to be alone." She paused then closed the door and wedged her sword against it so it wouldn't open from the outside. I spoke again. "I feel safer when you are here... with me." "Anna," she took a step towards me. "So long as you are here, in my protection, nothing is going to happen to you." I looked again into her deep brown eyes and something stirred inside me. My heart missed a beat. The feeling was like fear, but I wasn't afraid and if I wasn't afraid why was my heart beating so fast? The gentle tone of her voice made me feel weak inside, why? What was happening to me? "Come," she said gently, "you have had a long and perilous journey. Get into the tub and let the hot water relax you and after, we will take our repast together." I lent my sword against the wall beside the large wooden tub along with my bow and quiver and placed my cloak on the ground beside them. I struggled to reach the laces which held my dress together at the back so Astrid stepped behind me and carefully tugged at the braids which released the bow then loosened the cords, allowing the heavy blue fabric to fall from my shoulders leaving me in a once white cotton chemise. I waited, unsure. Astrid was still behind me, so close I could feel her warm breath on my neck. Suddenly she seemed to become aware of my discomfort. "Oh. I'm sorry," she said quickly and began to turn away. Turning sharply to her, I put my hand on her arm. "No!" I said, quietly, "You don't need to turn away. I don't know why, but I don't mind you looking at me." I released the tie and allowed the chemise to fall to the floor around my feet then just stood, not knowing what to say. Astrid just looked at me, her beautiful brown eyes taking in every detail of my slim, toned body from my long, scraggy, unwashed hair all the way down to the tip of my toes and back up until she looked into my eyes and said, "Anna, you are so beautiful. Why do you not have a husband?" I blushed so deeply that my whole body must have turned a shade of pink. "I... I don't really know. I don't want a husband, not now, not in these vicious times." "But you are a Princess. Doesn't your father need an alliance?" Astrid seemed puzzled that I wasn't following the path normally destined for the daughters of kings. "There is no-one left to form an alliance with," I let my eyes drop for a moment, then whispered, "except you and you don't have a husband either." She looked wistful. "No," she said quietly, "my father was killed along with my only brother. It has fallen to me to defend the forest as well as I can. I don't know how long we can hold out as Samerron's might increases day by day." Forgetting my nakedness for a moment I reached up and took her face in my hands. "You are strong, I am strong and together we will beat this enemy! Samerron thinks he is invincible and that will be his undoing. We must fight together and show him we are stronger!" The warrior princess placed her hands upon mine as I held her face and gazed deep into my soul. "You were sent to me by the Gods, Anna, you are right. Together we will be a force for good. we will defeat this evil and drive it from these lands for ever!" I was mesmerised by her gaze and slowly I remembered I was naked and she was not. It was as though she had grown tall and powerful and I had become weak in her presence. I began to loosen my grip on her face, but she held my hands tightly and smiled then quietly whispered, "Together." "Yes," I whispered back, straightening up and standing tall. "Together." She released my hands then and stepped towards me. I put my arms around her and held her close, feeling the fabric of her dress against my naked flesh and the warmth from her body as her arms wrapped around me. I felt an odd sensation course through me, a sensation I had not felt before, but not unpleasant, quite the opposite in fact. Releasing me, then, she stepped back. "Come," she motioned me towards the hot tub. "Get in. I will wash your back then, when you are clean and refreshed, we will return to the main hall and take food together. There is not much time. We must address the council and plan our moves." I didn't know what I was expecting, but I stepped into the tub and leant forward. Astrid poured warm water over my head and gently washed my back with a cloth and her hands. Little tingles ran all over and through me as her hands worked the soapy cloth all over me, across my shoulders, around the sides and down my spine to the base and back. Her hands chasing away all the tension and weariness that still remained. I tilted my head back and she washed my hair, her fingers massaging my scalp firmly and drawing through the long wet strands, removing the last vestiges of travel grime and making my head feel so good. I closed my eyes as she worked and slowly began to lean back towards her, resting against the hard wooden side of the tub. I didn't want her to stop, I felt relaxed and safe for the first time in many months but, all too soon, it was over and I finished bathing and climbed out of the tub. My warrior princess held up my cloak and guided me to sit by the fire to dry off. As I sat she took a brush and began to brush my hair dry, gently pulling it through the matted strands until it was sleek and shining in the glittering light from the crackling log fire. Finally, she took strands from either side and began to plait them, pulling the finished braids around my head and plaiting them together at the back like a tiara. "There," she remarked, "Now you look like the beautiful princess that you are." "Your Highness." It was one of the wash room maidens. Astrid removed her sword and opened the door and bade entrance. The woman was carrying some clothes and was quickly followed by the other servant who was also carrying a bundle of clothes. "As we are going into battle,” Astrid told me. “We must prepare ourselves." The older of the two women came forward, bidding me to stand so she could help me prepare and slipped the cloak from my shoulders as I did so. Immediately I covered myself with my hands. "You don't need to be shy with us, M'lady. We've seen it all before!" She laughed, but I remained covered until I had to raise my hands to slip into the cotton shift she was holding out in front of me. I stepped into it and put my arms into the sleeves. Across the room I saw Astrid was disrobing, the maid pulling at the lace which held the bodice of the flowing white dress together. The dazzling fabric, released from its constraints slipped from her shoulders, falling around her feet. she lifted first one foot and then the other, allowing the maid servant to remove it and place it on the table to the side of the room. Astrid's dark skin was in stark contrast to my own pale skin. She looked no different to me, but her tanned flesh made her look more aggressive, more imposing. She had full round breasts filling the gathered fabric of her undergarment far better than mine and her full pouting lips so pretty. As I looked she turned her head to me and noticed the attention I was paying to her and smiled, her dark eyes twinkling. I smiled too and dropped my gaze, slightly embarrassed for I had not seen a woman so beautiful, so powerful and yet so feminine. Once again I felt my skin redden and my face tingle with heat. "My Lady..." the serving maid coughed lightly, holding up a long heavy dress of darkest purple velvet. I lifted my leg to step into it as she bent before me and then the other, then helped her pull the heavy fabric over my arms and onto my shoulders. I stood still whilst she pulled the laces tight behind my back. The sleeves were long and at the wrists were small holes for my thumbs which had the effect of holding my sleeves firmly thus keeping the fabric away from my sword hilt should I have need to use it. Astrid was being dressed in a knee length dress of brown leather which hung to her knees in pleated strips allowing her to move easily, her strong dark legs naked below save for the leather boots which would protect her ankles and lower part of her legs with leather straps, wound around and tied off at the top of her calves. The dress protected her body and around her neck was a high collar of leather. Finally, around her waist, she fastened the heavy sword belt and adjusted it so the ornate sword hung regally by her side. I turned my head away as my own maidservant gently touched me to draw my attention to the fact she was offering me my own sword belt. I took it from her and threaded the thick leather strap through the heavy gold buckle, then, taking the dagger in its small leather scabbard, I fastened the straps around my upper arm where it had been when I needed it the day before. I was ready now, for whatever lay ahead and when I turned back towards my new ally I saw that her maid had drawn her sleek black hair into what looked like the tail of a pony, giving her an air of authority and severity, tying it with a band of woven gold. She stood and seemed so tall and fearsome and she turned to me and said, "Now we shall eat. I am sure you are more than ready." I picked up my cloak, bow and quiver and walked beside her back to the grand hall where many men were now gathered. I recognised the man who had rescued me from the enemy soldiers. He bowed as I approached. "Your Highness," he said. "Please, Fabian," I protested. "There is no need to bow to me. You saved my life and for that I shall be eternally grateful." Astrid bade me sit beside her at the head of the long table. When we were settled and the food served she spoke. "Gentlemen." Her voice was loud and strong and all the clamour ceased. "This is Anna, daughter of King Wendell of Pelengrath. She has come seeking help against the enemy Samerron." The sound of muttering began to rise from the assembled commanders. Astrid raised her hand and silence was immediately restored. "The time has come. We cannot just sit back and defend our forest any longer. The enemy has become so powerful that it will only be a matter of time before he overruns us also." She paused as a voice spoke out. "Princess, the enemy is gathering on our borders. What chance do we have to save ourselves, let alone assist in the relief of Pelengrath?" There was more murmuring and nodding of heads and once again Astrid raised her hand. "We have no choice, Gentlemen. Pelengrath is the only ally we have left. There is only one chance and that is to attack Samerron and break the siege of Pelengrath before he is able to build up enough strength to attack us. We have to leave only enough kinsmen to defend the forest from the skirmishes that have plagued us in recent days and every other able man must ride forth to Pelengrath and attack the enemy where he least expects it, from the rear and under cover of darkness. His men are not forest dwellers. They will be no match for us if we get to them before they break out." As we ate we discussed tactics and plans until long into the night. "Gentlemen, it is decided. We leave tomorrow night. Return to your garrisons and assemble every man you can muster. Sleep through the day and be ready to march at sundown!" As the commanders left the great hall the buzz of conversation died away leaving just the sound of the servants clearing away the utensils. Although I had slept for so long the previous night, I was once again weary. The planning had gone on for many hours and I looked at Astrid. her dark eyes were bright and flashing. She looked so alive! She turned to me then. "At last we can fight back," she smiled, "We have been inactive for far too long. The hour has come!" I smiled. Her beauty shone out like a beacon in the darkness. "Together," I replied taking her hands in mine and squeezing them, her eagerness for battle becoming infectious. "Yes, together," she said and turning, led me by the hand to her chamber where we were to sleep as friends, equals, sisters in arms!